Here is our creative way to deal with our Mother's collections of handmade items and Chatzkies. 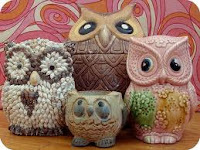 Each mourner at Mom's service gets to take home their choice of either one of Mom's owls, Mom's tea sets or Mom's handmade afghans. We are calling them departing gifts. It sounds better than party favors. I am picturing Oprah pointing at people in the pews and yelling 'YOU get an owl and YOU get an owl and YOU get an owl. . . . There are at least 25 owls (left after we each took the ones that we wanted) and at least 20 pair of owl earrings. There are five tea sets. There are 4 more recently made afghans to give away. Our idea is that WHO ever you are, take an owl home with you and Mom, who was a HOOT, will watch over you. The tea sets? I do not think she ever used ANY of them. They all sat pristine in her china cabinet from the day she got them. 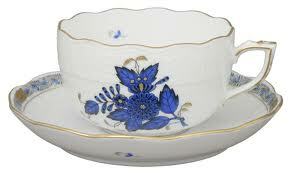 The photo of a tea cup here is from MY set that my husband bought for me in Italy many years ago. I use it regularly. Yesterday I rode out my sudden desire to eat and keep eating. I had to take another 2 mile walk in the evening but I made it through another day. Glad you are resisting getting into the food as you process your mother's death and mourn. I love your plan to share your mother's things with those who will attend her funeral. I'm sure she would have approved. P.S. I have a blog I read that is a mother whose son died two years ago from a brain injury. She has a garden for him and she has been collecting owls to put them in her garden. If you end up with any and are going to donate them, I would love to send her one. I would pay for the postage too. Katie J - YES! Excellent idea. I will let you know if there are any left (and I think there will be). Cool idea! What a nice way to honor your mom's memory. Congratulations on staying away from the food - I know that you realize this, but each day that you do so will make the next day easier. I had a very dreadful stay with my husband's mother many summers ago. And every time I felt uncomfortable, I took a walk. Every time I took a walk I grabbed one of my kids or my husband to walk with me. I spent a lot of time walking, each walk I had great conversation with someone. My first year of weight loss, now in retrospect, the main benefit of all my walking time and my exercise class time was not the calorie burn as much as it was giving myself somewhere safe/food less to go. Vicki - east coast? Want an owl? Also, I have a suggestion. There's this thing I do called "stomp and state" which is designed to help me actually physically feel and release any "negative" feelings I might be having. I wrote a blog post a while ago about it. Basically, the idea is that our emotions literally reside in our bodies and unless we release them, they stay and wreak havoc on us. So how to we move through the process of actually feeling our feelings and releasing them? By stating what we're afraid of/angry at/sad about and at the same time moving our bodies. Certain physical movements accompanied by vocalizing helps get the emotions moving. LIke a child having a tantrum to release anger/frustration: pumping the fists, bouncing, stamping, flailing the arms...these are all great ways to move while vocalizing. I wrote about out what came up for me as I did the "stomp and state." I was amazed, not only to hear what came out, but in how I could "feel" the emotion in my body physically...it moved and finally I released it out the top of my head. I love that idea. Such a treat for the people who loved her to have something so her to remember her by. Smiled at thought of swinging by to pick up an owl. Was telling my son the story of the memorial gift bags on our drive. Very clever. Did you get rid of them all? Lined the rest up in front of apt with free to good home sign? Or I could see them perched on grave stones like pebbles/stones at Jewish cemeteries. Home and exhausted. going to sleep today and work tomorrow. all the owls have a home. will share the story soon. how did the apartment hunt go? As the child of someone who collects things that I don't want a collection of, I think the departing gift idea was a great one! So sorry that your mother passed away unexpectedly. I'm impressed with your ability to grieve without the food.